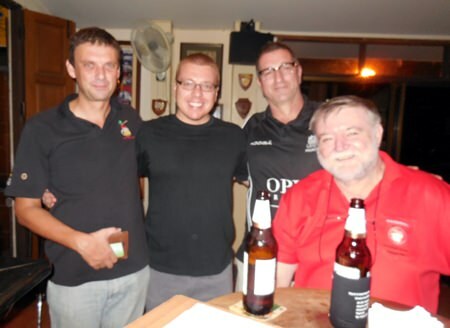 Winners of the U.N. Irish Pub’s weekly pub quiz on Thursday, July 24, 2014 the Kissed Punts celebrate their victory. From left to right: Andy, Spencer, Kevin and Barrie. 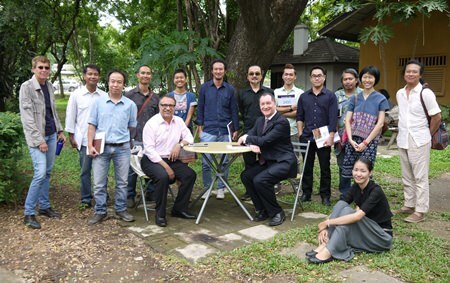 On July 26, 2014 U.S. Art Envoy Hossein Farmani met with artists and representatives from art spaces in Chiang Mai to share their experience at a conference on the Business of Art at Chiang Mai University’s Center for the Promotion of Arts and Culture. 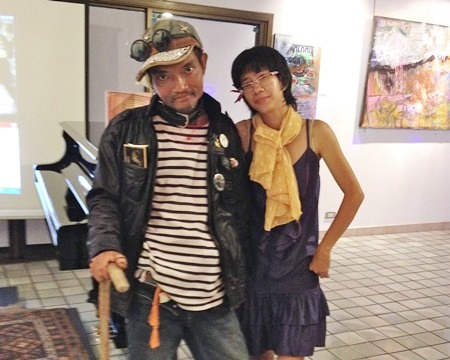 The event was co-organized by Chiang Mai Art Conversation (CAC) and supported by the U.S. Embassy in Bangkok. TJ Bouma (2nd left) celebrated his birthday with friends and fellow Rotarians at the Chiangmai Gymkhana Club on Sunday, July 27, 2014. Here he is seen with Jenny (far left), Chamnan, Suparie and Elsie. 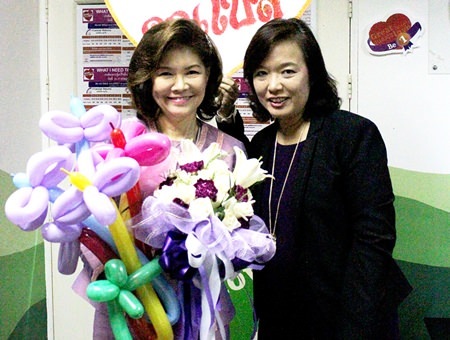 General Manager of Holiday Inn Chiang Mai Stella Jacobs offers a bouquet of flowers and birthday wishes to to Khun Charintorn Wiraboonchai, Senior Assistant Managing Director of Holiday Inn Chiang Mai at her birthday party held at the hotel recently. Shauna and Krathai celebrate their 3rd anniversary at Soho Bar & Guesthouse on Huay Kaew Road with friends Wouter and Naphat and even smaller friends Sha-sha and Sophie! 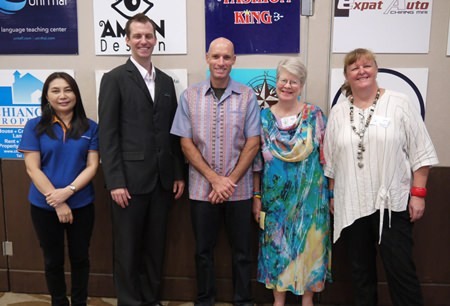 Andrew Bond (center) spoke on the hidden gems of Chiang Mai province at the Chiang Mai Expats Club meeting on Saturday, August 23, 2014 at Le Meridien Chiang Mai. 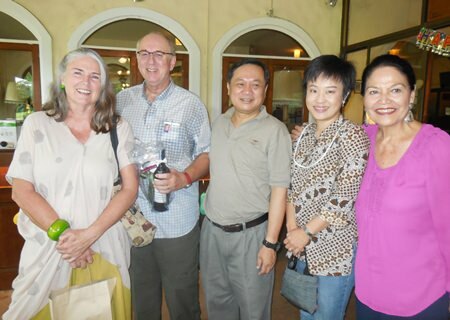 He is seen here with (from left) Phongsri Karnkonsue, the manager of the Kad Suan Kaew branch of Bangkok Bank, Michael Hofstetter of Le Meridien, President of the Expats Club Nancy Lindley, and Board member Eveline Willi. Napassanan (Aom) Krainara of Earth Wind & Fire Co., Ltd. (center) visited the Chiang Mai International Rotary Club at the River Market on Tuesday, August 6, 2014. 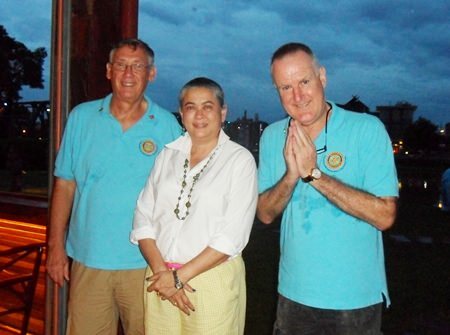 She is seen here with President Roger Lindley (left) and Service Officer Laurence O’Keeffe.